Denise Finefrock, Big Blue and a Tecate. Big Blue was always a part of my life: My dad, Monty, owned it before I was born, and still had it in the driveway when I moved away to college. My mom bought him the license plates and made him a set of curtains before they got divorced. As early as I can remember we were camping all over California in the bus. The picture of my sister smiling standing in the doorway of the bus pretty much says it all. My dad always kept a bar of zest soap near the water spigot, salt and pepper shakers, paper towel on the holder, and beers in the fridge I am sure. In the background, the 1970s curtains had been replaced with ones my stepmom made, which matched the blue vinyl cushions. The pop up table is out and covered with limes and beer, someone is lounging on the backseat, and the awning is out. But when we were ready to go, everything would get folded up, packed away, in its proper spot and we would be off. Big Blue was so well designed for living, I never remember feeling like we were living out of a car. Laura and Denise making sandwiches inside the awning. When I was nine we drove from the Bay Area to Cabo San Lucas for the solar eclipse. We spent over three weeks in that bus in the summer in Mexico with no A/C. My sister and I (she was six) fought over who got to ride in the shiny new VW that Charlie (a friend of my dad) had, because it had electric windows and A/C. Our stepmom packed us a box of food (see the picture of us making peanut butter sandwiches) and a box of activities, including the Loteria cards. For most of the trip we slept in hotels, but once we arrived in Cabo we camped out at a mobile home park and slept in the bus for a week. We cooked in a Dutch oven, sitting in folding lawn chairs. We made it back to the Bay Area in four days; I don’t even remember how many thousands of miles we drove in Big Blue that summer but they were some the most interesting and fun miles of my life. Like my sister, the bus was there long before I came along. In fact when my sister was born, my dad decided to add the pop-up top so that the whole family could fit in the bus. I remember my sister and I would share the main bed down below on those blue-green vinyl seats. 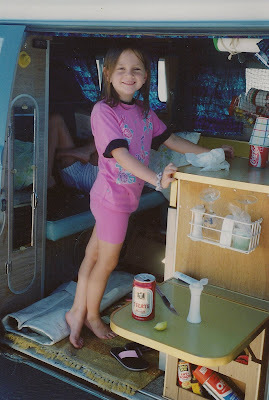 I was still fairly young when we did most of the traveling in the bus, but my best memories are of the solar eclipse trip and camping in the bus in the Santa Cruz Mountains. As we got older, my dad would still use the bus for his annual Reno Air Races trip, but we went along less frequently. Still, we all knew not to mess with the bus! Not only did the bus have a special place in the driveway, you had to be very careful when you even got close to the bus. Whether raking leaves or learning to park your car, it was best to keep a distance from the bus, just in case. Some weekends, my dad could spend a whole day out at the bus, just cleaning and tuning it up. It wasn't just a car to our family, but an institution. One of my favorite memories of Big Blue was the three younger kids using it as their playhouse. They would pack up supplies from the kitchen and where ever else their imagination took them and haul it out to the bus. They would play in the bus for hours pretending that they were going camping one minute and then in the next minute it would turn into a school bus! They had many adventures without even leaving the driveway and I could hear their laughter which always made me smile. They made a few attempts at sleeping in the bus for a night, they thought it would be so great to have us sleeping inside the house and them snuggled up in the bus while it sat under the pine tree in our driveway. They would work hard making it cozy, figuring out who was sleeping where and who had what sleeping bag. What treats to bring and what kind of entertainment. Then they would announce that they were ready to go and off to the bus they went, flashlights in hand, it could take them a whole day to make these plans! But within a few hours we could hear them calling from the bus, that they decided it turned out not to be such a good idea and in they would come back to their own beds saying maybe when they got a little older! We made many camping trips in the bus and we always had a great time. Even if it took a while to get to where we were going! And it didn't matter if we were camping in some amazing Redwood Forest or if it was just simply sitting in our driveway. Big Blue just meant a lot of fun!